For all those desperate to be the Doctor’s new companion – seriously, how do we audition for that? – here’s a guide to decking yourself out in all the epic Who merchandise. Good job Christmas is on the way! Any Doctor Who fan would be thrilled to receive one of our top 10 favourite themed gifts – and don’t worry, it’s fine if that fan is you. Even the Doctor has down time! Kick back and relax in this soft fleece hooded robe. Featuring a rather fetching TARDIS design and two front pockets – you can store your sonic screwdriver in one and TARDIS keys in the other. Now you can’t have the dressing gown and not get the matching slippers. Encase your feet in Doctor Who history with this stylish piece of TARDIS-style footwear. Breakfast time will have never looked so good. The must-have in literature this year seems to have been nothing to do with writing at all. Colouring books have absolutely stormed the high-street bookshops and are the best way for the less artistic to get creative. The book features illustrations with a variety of famous scenes and characters including John Hurt’s War Doctor and the Weeping Angels. Just remember to stay in the lines! The bad news is this super cool pillow set may be just another reason to argue over which side of the bed you want to sleep on. If you’re lucky enough to have a double bed to yourself – each night you can decide if you feel more like the Doctor or the companion. Who knows, you might even wake up and have swapped roles?! If Matt Smith was more your bag than Capaldi, this apron will let you relive the bow tie years in the comfort of your own home. Perfect as a costume or just as something to throw on whilst your making fish fingers and custard. Snap it up quickly as, at this bargain price, they’re bound to sell out. Exterminate, exterminate! We imagine hours of fun will be had with this inflatable remote controlled Dalek. Really, what more could you want? This gadget sits at 2 feet tall, has 360 degree movement and sound effects. So if nothing else, it’s a great way to scare the cat. You are the Doctor in this interactive, electronic board game. Your TARDIS is broken and you must travel through time and space collecting components to repair it. It’s not that easy though, the Daleks are chasing you all the way and you must avoid them at all costs. Sit down with the family at Christmas and get stuck into this adventure. Christmas just wouldn’t be complete without a themed jumper and this one should take pride of place on your chest. Featuring the Cybermen, Daleks, the Weeping Angels, the TARDIS and, of course, some festive touches – there’s nothing more appropriate for a Whovian on Christmas Day. The ultimate experience for any fan. 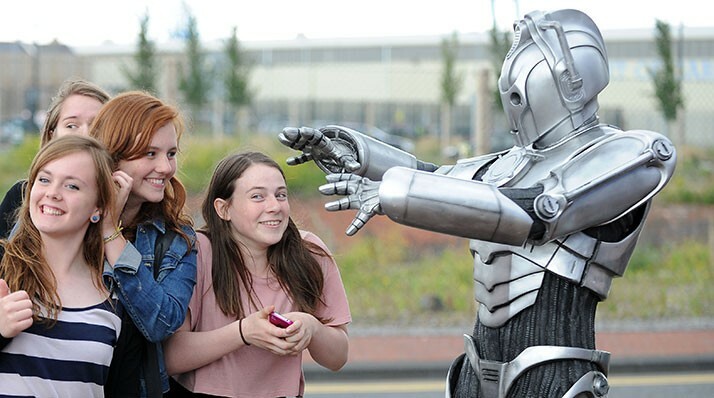 Located a stone’s throw away from the BBC studios where the show is actually filmed, this is a dream day out for anyone wanting to get behind-the-scenes of Doctor Who. Children and adults alike will be mesmerised by the interactive experience with Peter Capaldi, the Doctor himself. If you manage to come out of that alive, then the exhibition hall filled with props, sets and costumes awaits you. This list would not be complete without the legendary sonic screwdriver. This isn’t any old screwdriver though, imitating the actual one used by 12th Doctor Peter Capaldi, this works as an advanced gesture-based infrared remote compatible with almost all home entertainment systems. Yes, really. So whilst you’re sitting at home in your TARDIS dressing gown as the cat is hunted down by an inflatable Dalek, you can turn down the volume on the radio with a flick of your wrist, and pop Doctor Who on your TV. What could be better this Christmas? Make sure you tune in on Christmas Day for the Doctor Who special.